Before now, getting a drone would cost a fortune, but of recent times different companies have produced different drone and the prices are now very affordable. But something we should take note of is that, it’s not all about getting a drone, but getting one that can serve the purpose in which it was purchased. 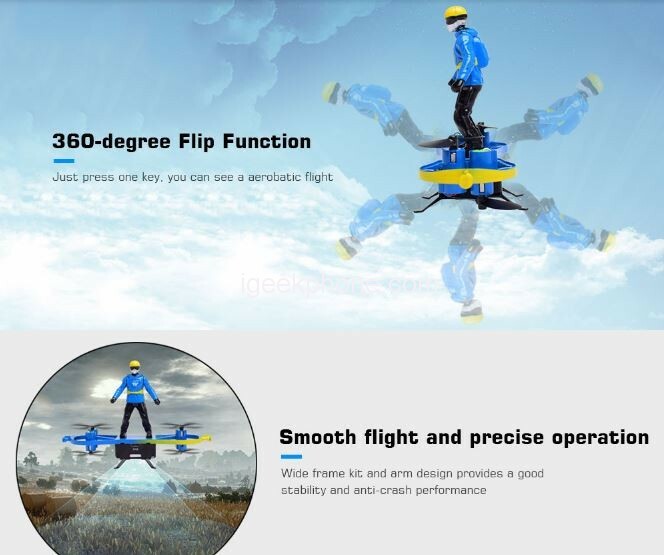 Today we come with an entry, the F5 Skateboard Parachute Drone which sports some amazing features and still comes with a very cheap price tag. Let’s get to meet the device. The F5 Skateboard Parachute Drone is fabricated from lightweight Acrylonitrile butadiene styrene (ABS)/ PS materials, a common thermoplastic polymer giving this device a strong resistance impact. It comes in two colors, the Dodger blue and the red color. It is quite portable with a cartoon man standing on it. It has a dimension of 14.00 x 5.00 x 10.00 cm and a total weight of 200grams. It comes with an amazing remote control which has compact and intuitive handling with comfortable tactile silicon and vibration signal make this remote control very convenient. The package contains1 x Drone, 1 x Remote, 1 x Parachute, 1 x Character Model, 2 x Spare Vane, 1 x USB Charging Cable, 1 x Screwdriver, 1 x Parachute Bracket. 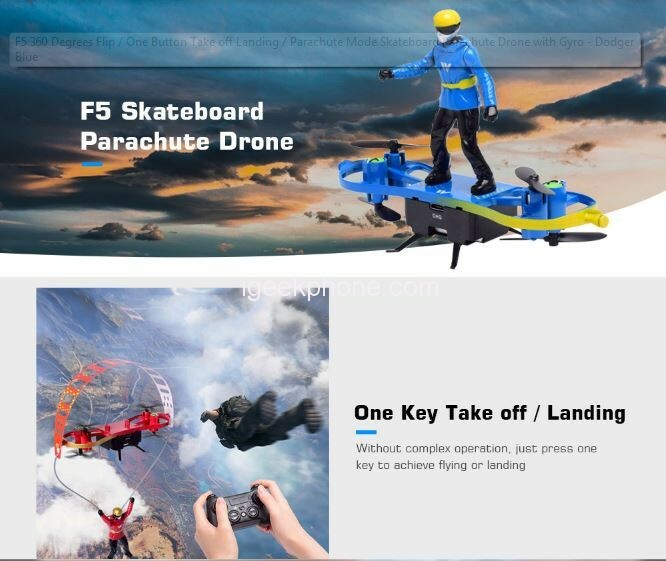 The F5 Skateboard Parachute Drone features several function/features, some of te features include, 360 degrees spin, Height Holding, One Key Circle, One Key Landing, One Key Taking Off, With light Built-in Gyro: 6 Axis Gyro. 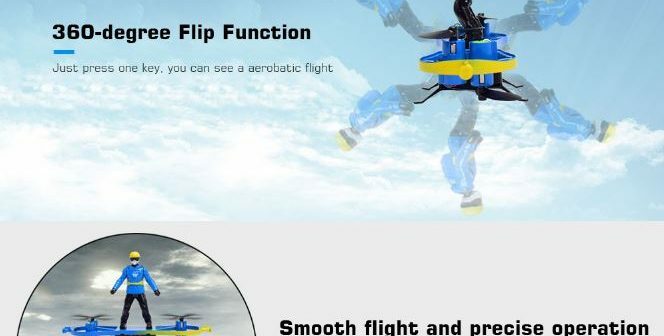 With it’s one key taking off, without complex operation, just press one key to achieve flying or landing. It comes with a parachute mode, which would require a parachute that usually comes it the product. The forward direction in the parachute mode is the direction facing the charging hole of the body. It is necessary to dial the switch button of the remote control to the right before starting the device. 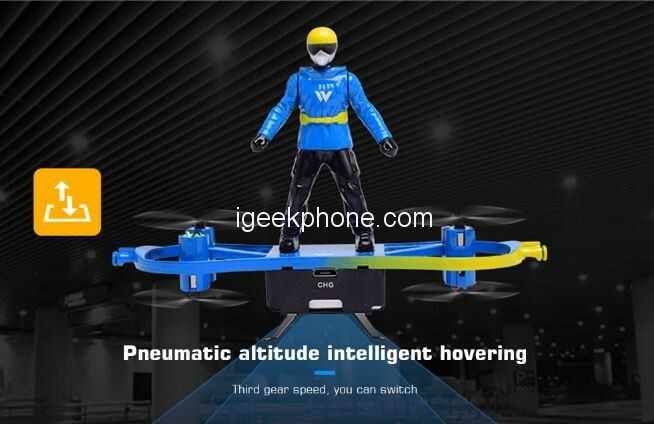 The F5 Skateboard Parachute Drone is currently available on Gearbest for $23.99. Previous ArticleAlldocube X tablet and F40 earphones Review- The Galaxy Tab S4 “killer”» tablet is here! Check where you can get it!